With many new and old players coming back ahead of Mists of Pandaria being released i am picking up lots of cheap recipes that i did not own for my enchanter and jewelcrafter from the Auction House - which have been dumped by these players as they power through content preparing their characters. 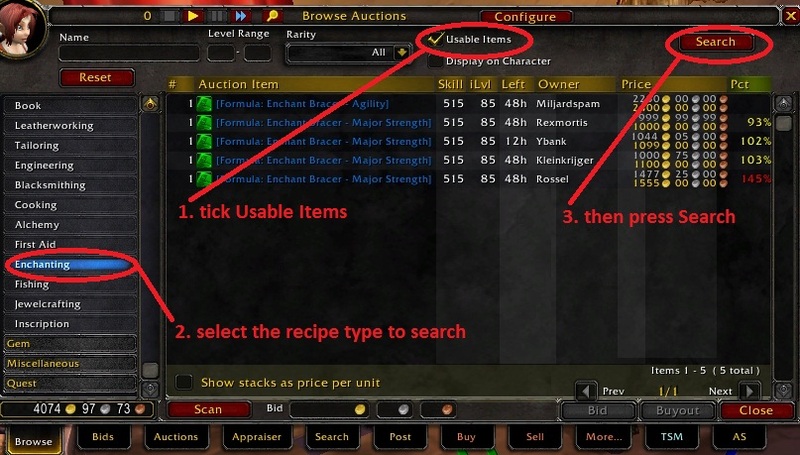 There is a very easy way to do this, only takes 20 seconds if you are at the Auction House. I always buy recipes that are priced under 100 gold - though these days i am taking any that look good price given this is a once in a while opportunity as these returning players are here. 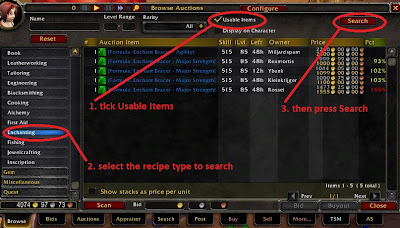 the example below shows that my the Auction House has 5 recipes that my enchanter does not have though none are below my 100 gold price. This can also work in favour of the power levellers too if they're smart. My main profession is Blacksmithing and I have about 90% of all the patterns in the game right now... I will pay a very hefty premium for the 10% I don't have that are BOE and get posted from time to time. Smart levellers will learn to do a quick TUJ search on patterns before posting - you never know what you might actually have picked up and could be posting a rare pattern for a pittance! yes, there are those that know what they are doing. also there are others like us who will do the scan before we get to the Auction House. All luck of the draw.